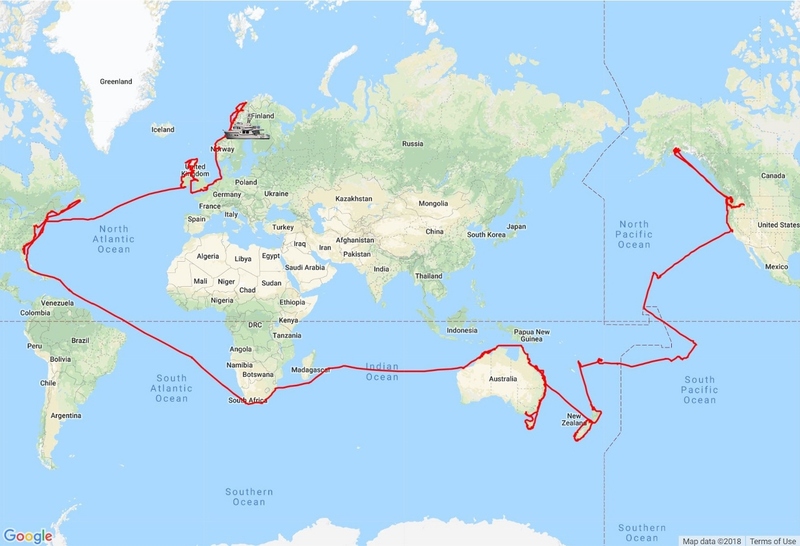 Over the last six years, we’ve seen a lot of the world and currently are exploring Norway. Our Deere has never failed to start and, more importantly, it’s never stopped when we were using it. Nothing makes you respect an engine more than being 1,000 nautical miles off shore in a single-engine boat. This engine has been simply amazing. What powers Dirona is a single John Deere Marine 6068AFM75 M2 at the M2 rating. This rating produces 266 hp and targets usage of 3,000 hours/year where the engine will run at full-rated output no more than 16 hours in 24 with load factors of 65% (of max rated output). If you include all running time such as warm up, cool down, idling in marinas, high output coastal runs, and low output ocean crossings, we average 44.2% of full rated output which is actually fairly high for a long distance passage maker. This marine engine is available in both Tier II and Tier III emission compliance configurations at the same ratings and power output levels. Where big differences show up is in the efficiencies of the two engines: the Tier II engine is 15% more efficient at rated output than the Tier III. We’re lucky that when Dirona was built the Tier III wasn’t yet required, so we get what is essentially a “free” 15% more range. That’s an incredibly small list of maintenance items for a 10,000 hours engine, but the repair list is even smaller. During the warranty period, Deere changed the turbo compressor housing (due to damage during engine manufacture or installation in the boat) and the cam position sensor. At around 3,000 hours, I replaced one of the accessory drive belt idler pulleys due to bearing noise. At around 8,000 hours I changed the turbo coolant vent hose and the coolant cap. At 8,029 hours Deere replaced the front pulley under warranty although there was no external sign of a problem. It’s pretty amazing when a manufacturer is doing warranty work on an 8,000 hour, 7 year old engine. At 9,522 hours, I replaced all 6 fuel injectors and the rocker arm carrier gasket when we were cruising in the UK. Overall, I consider 9k hours to be excellent longevity for injectors especially since we have been buying fuel of uneven and sometimes low quality all over the world. That’s the full list for all the maintenance and repair work done during the 10,000 hours that our Deere 6068 has been in use. What I find even more amazing is this nearly nine-year-old engine, that has clocked over 10,000 hours, is still a wonderful bright white with no ugly oil lines running down the side. And other than cracked paint at the high temperatures turbo-to-aftercooler pipe and the exhaust ports in the cylinder heads, the paint is perfect,and the engine still looks like new. Our 6068 also serves an unusual duty as a backup generator. 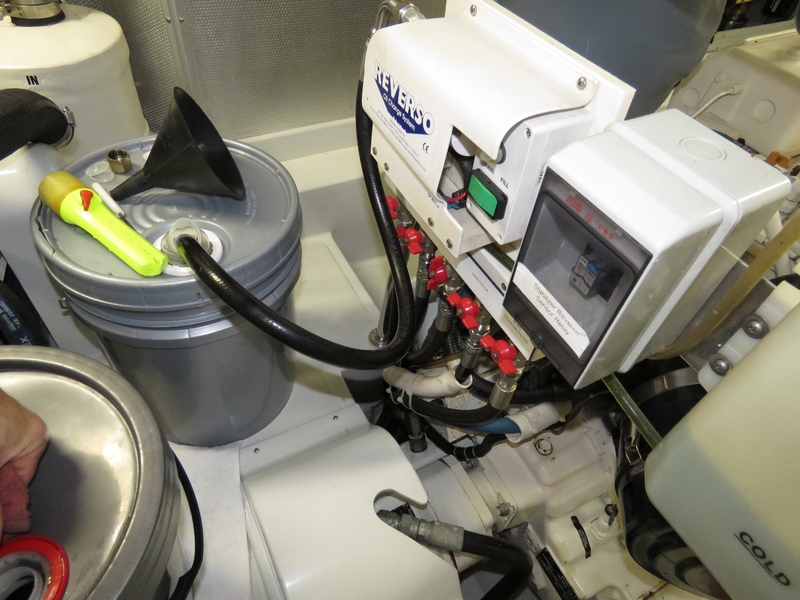 Dirona has only a single 12KW generator and we really depend upon the generator to keep our batteries charged when we are away from the boat at anchor. If the generator fails, we could serious damage and shorten the lives of $6,000 worth of batteries, plus potentially lose all the food in our fridge and freezer. Replacing the batteries would be both expensive and potentially hard to source quickly in an out-of-the-way part of the world, as would restocking the fridge and freezer. Our generator has never failed when we were not on the boat but it will almost certainly happen someday so we really want a backup generator. But we really don’t have a place to put a second generator so we decided to ask the Deere main engine to serve this backup duty as well. Our Deere has two Balmar 190A and 24V alternators driven by the large serpentine accessory belt on the front of the engine. Each of these alternators can reliably put out 4kw continuously and, for shorter periods of time, can produce up to 9kw together. They are absolute beasts and we love being able to run SCUBA compressors, the oven, the dryer, or multiple heating or air conditioning units when underway without starting the generator. We have autostart on the generator so, as the batteries get down to about 55% charge, the generator is started automatically. It then is allowed to warm up to 150F and the load is applied. It runs until the batteries are charged to about 85% charge at which point the load is automatically removed and generator is given a minute to cool down before being shut off. This has never failed but we know it will. All it takes is a cooling pump impeller failure to stop the generator so we knew we needed a backup. We put a Dynagen TG410 controller on our Deere main engine. Dynagen makes excellent equipment and has good customer support so this was an easy choice and was not a complex install. 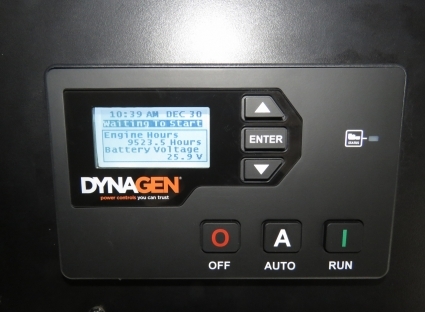 If our generator fails to start after three tries or if it has a mechanical problem and shuts down, the autostart system will send the command to the Dynagen TG410 which will start the our Deere main engine and bring it up to 1,300 RPM to charge the batteries. In this mode, it’ll charge at 8kw until the batteries are brought back up to 85% charge and then the automation system will shut the engine back down. The main engine autostart system has actually has been tested once after I accidentally left the generator in a disable state, so we know it works well. It’s great to have the Deere ready to go if we ever have a real generator failure or for some reason the generator is unable to start. 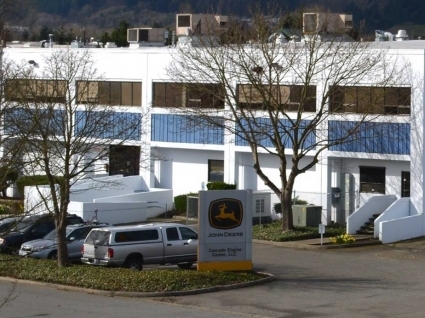 Cascade Engine Center is the Deere distributor that sold the Deere 6068AFM75 that powers Dirona. I had many questions during the build of Dirona while figuring out which engine to use and Greg Light, who was at the time the VP of Sales and Marketing (now Tim Sandeman) at Cascade Center was incredibly helpful. But, at least for me, the real test is after the engine has been paid for and installed in the boat. The first test wasn’t until 2011 up in Prince William Sound, Alaska. As we neared the dock in Valdez, the engine produced a fault code of 636.08. 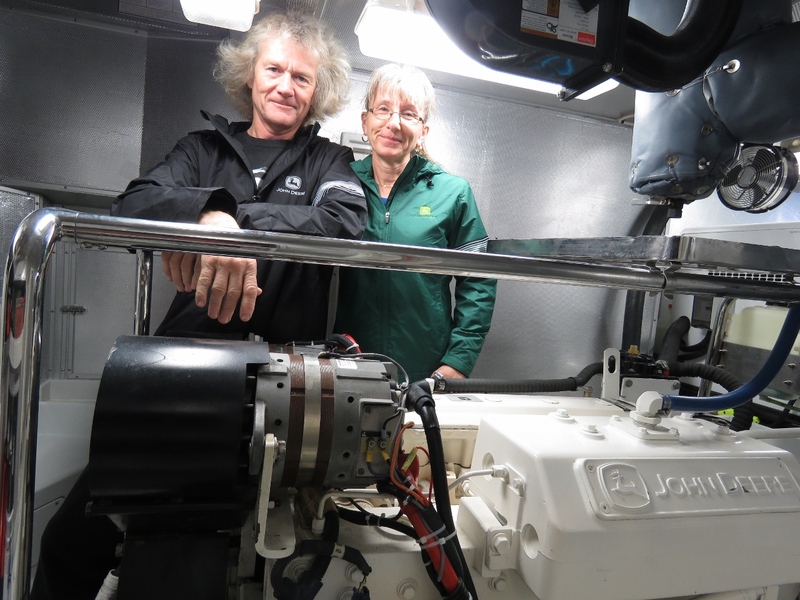 The engine continued to run fine so we docked and I sent email to Greg Light asking for advice on the code and whether we could continue to operate without immediate service. We then left the boat to walk into town for lunch. Before we arrived at the restaurant, my cell phone rang. It was Dwight Allen the Cascade Engine Center General Service Manager. I’m not even sure how they found my cell number. Dwight explained that it was a cam position sensor fault and very likely was just a bad connection at the sensor, but he would send someone down to our boat to change it once we were back in Seattle. In the interim, he explained that the cam position sensor is redundant with the crank position sensor so it being intermittent or even missing entirely wouldn’t reduce engine output or impact engine operation or performance in any way. In under 45 minutes from the engine fault code first showing up, I had both a definitive answer on the cause and an appointment to correct the issue once we returned to Seattle. I was super impressed and, over the years, Dwight and Cascade have always maintained this same ridiculously high standard of service. I love them. The Deere has done 10,000 hours and still looks new. What can it do with more time? I’ve seen Diesels in generator applications wind up well over 30,000 hours of reliable operation but main engine applications are harder on engines. Our main engine RPMs change dramatically relative to a generator, sometimes the load is far higher than a generator application, and other times the load is close to zero. 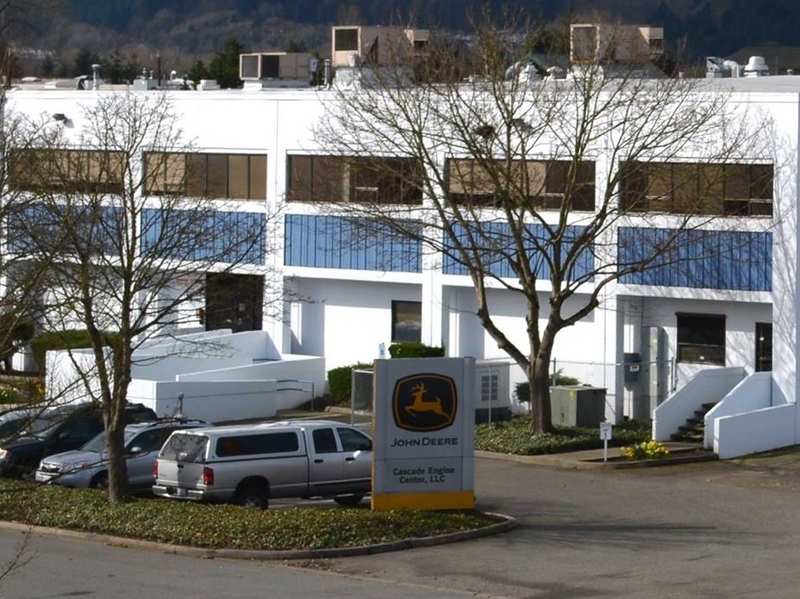 It lives a harder life than a generator and yet many Deere’s in main engine applications have delivered up above 30,000 hours. We run our engine fairly hard with the average load being 42% of rated and have run days at a time max continuous output. Some experts argue that the conditions we operate under are actually better for the engine than most generator load profiles. I hope they are right but, from our perspective, if we can get up over 15,000 hours without having the cylinder head off and up over 20,000 hours without any lower end work, we’ll be very happy. If it goes up above 20,000 without the engine needing to be opened up, I’ll be ecstatic. Let’s see what the next 10,000 hours brings. You mentioned Tier III JD is 15% less efficient than the Tier II models. I thought the purpose of Tier III is to be cleaner than previous technology. Burning more fuel seems counterintuitive. It is a strange fact that deserves more research to understand why. Yes, I agree with you but that it does seem wrong or at least counter intuitive that a Tier III emission compliant engine would actually be less efficient than a Tier II compliant engine. But the emission standards constrain emissions but not fuel burn. The Tier II emission standard forced just about every engine manufacturer to go to a high pressure, common rail injection system with full electronic control. This improved emissions and, at the same time, increased fuel efficiency. The John Deere engines improved by roughly 15% in going to high pressure, common rail. The next standards were met by different manufacturers in different ways. Deere chose to support the same ratings and to use just about exactly the same mechanical components. However, the tuning necessary to meet the Tier III requirement reduced efficiency over the Tier II engine by 15%. It’s not a disaster in that it’s just returning to the efficiency of engines a decade or so back. But, it does mean we have effectively 15% larger fuel tanks than older engines or the newer Tier III engines. Some manufactures will have chosen to make deeper changes to achieve Tier III so I would expect some Tier III engines to actually exceed the efficiency of a Tier II engine but it’s worth checking Tier III isn’t always better than Tier II from an efficiency perspective. Thank you James, I have a better understanding now. And congratulations for the 10K hrs achievement. I remember the blog post when the engine was being prepared by the dealer. Can’t believe it was 9 years ago. Happy cruising! Wow, that was a long time back. I just went back and looked at that article: https://mvdirona.com/2009/04/john-deere-6068afm75/. It’s pretty cool to see our engine at hour 0 running at Cascade Engine Center in Seattle. Great article. Roam (N4708-2003) will tick over 10K this winter with no serious issues. We’re running the Lugger LP668T. 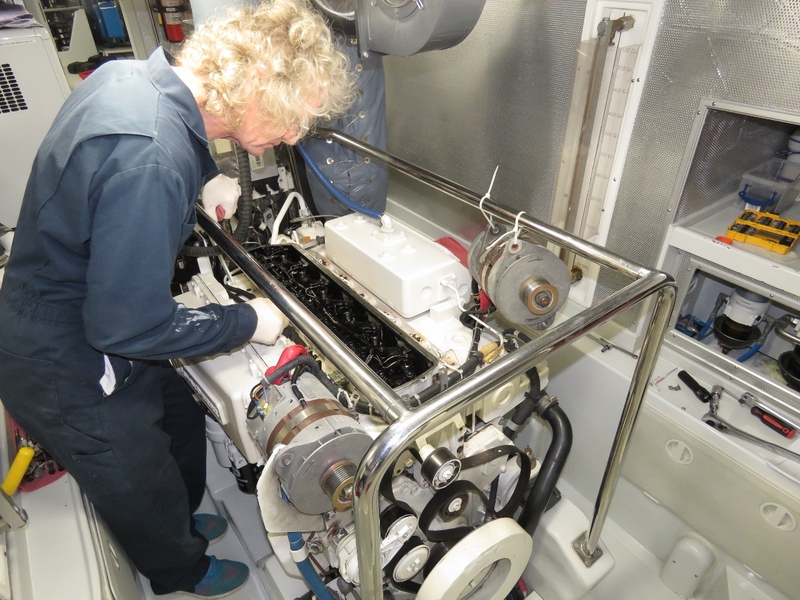 This year I’ve performed a number of PM tasks – new Motor Mounts, New high pressure hoses, valve adjustments, new injectors). It starts instantly and burns almost no oil. Can’t wait to see where the next 10K takes us! Good to hear. The one thing I didn’t follow was the reference to high pressure hoses on your main engine. Are you referring to hydraulic hoses at the main engine PTO? Although your load factor is relatively high, that engine was designed to handle a lot more power and has a very conservative horsepower rating in your application. Don’t cheap out on filters, keep doing your oil changes regularly, and that engine should last a very long time. If you’re not already doing oil analysis, it would be a very good idea to start doing it. Ideally, you’d do it from the beginning when the engine is new because it’s all about trending, but you should do it at every oil change to ensure you catch a problem as early as possible. We measure particles in the parts per million range and also monitor for oil degradation and contamination. We’ll stay current on the maintenance and filters as you recommend Dan. Well, you promised a 10k hours blog post, and we got a beauty. A simple, robust, and field-proven setup that just works. Credit’s yours, even if you were standing atop the shoulders of giants (cf, your main and wing engines). If, knowing what you know now, you had to do it over again, would you do anything (propulsion/mechanics/fuel system/etc) significantly differently? What would we do different? One thing we did go different is asking for an upgrade from a 163hp standard main engine to the 266 hp Deere 6068AFM75. That was a big ask at the time and considered “different” at the time. But it’s now the standard N52 engine and, given all we have seen, we would probably just do it again exactly the same on the main. On the wing engine, it’s pushed to the very limit. We have the hydraulics system setup to extract 100% of the power from the wing. When we are docking or raising/lowering anchor, the wing engine is running at 2,600 RPM and when the hydraulics are called for it goes from high idle to 100% load. That engine lives a very tough life. We would be much better off with about a 70hp wing engine. The Lugger L844d has over 900 hours on it and it always delivers when needed but, were we to build another N52, we would want a larger and more capable wing engine than this 40hp power plant. Further complicating things, the current emission certified wing engine is a Yanmar that doesn’t have a hydraulics power take off. We wouldn’t do the boat without hydraulics so that’s yet another reason why we would need to upgrade the wing. The Generator is a Northern Lights M844NW3.3 12kW system and it seems close to perfect. We draw 100% load from the generator when it’s charging at full output and then it tapers off but never goes below 20% load. It’s pretty much perfect for our configuration. We are generally very happy with the system and we wouldn’t change much. I would love to carry around 2,200 gallons of fuel rather than 1,750 gallons but finding a place for it would be challenging. With some care we could probably take up some space in the Laz for another 500 gallons. I think this would be hard to do well without blocking access to through hulls and the ability to easily service other things so it may be more of a “wish” than something that we would actually change on a new build. Other than that, I can’t think of much in the engines and mechanical front. 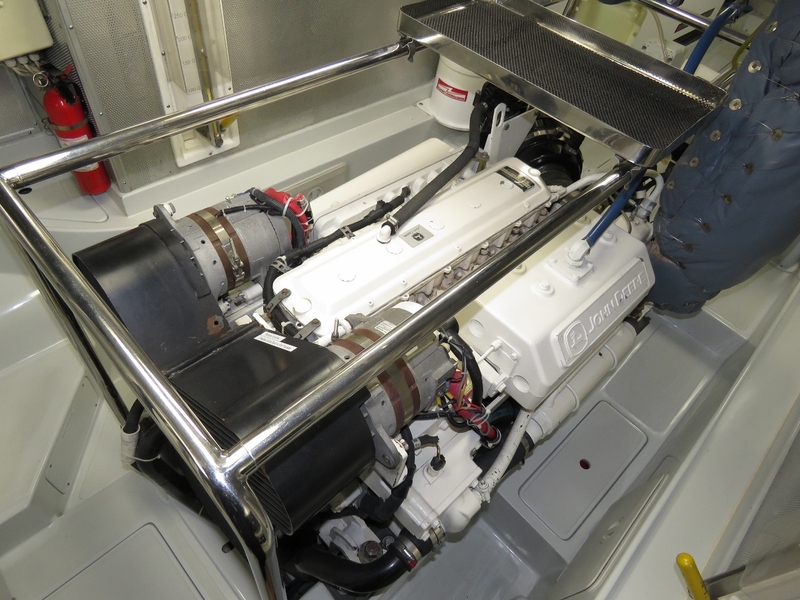 Are you able to expand a little on why you would not do a boat without hydraulics? Electric thrusters can operate continuously — that’s the way cruise ship thrusters are built and I’ve seen cruise ships leaving the dock with the thrusters on full for upwards of 5 min. Not even close to a problem. However, that’s not a design goal for recreational thrusters. When they are new, the have a fixed and in many cases very low time they can operate before they go into thermal shutdown. As they get older, this time shortens. Arguably you don’t need 5 min but, at least for me and boats, I like to have large amounts of engineering safety margin. I don’t ever like to get even close to the limits. The same argument applies to the windlass. We want a windlass where we can power it down 400′, not like the set, power it back up, then do it again. On our previous boat, we got unlucky in a near 100′ depth anchorage and needed to do a third try. The windlass couldn’t do it and it ended up needing to be replaced. The hydraulic systems can run the windlass up and down multiple time without issue. Overall, we enjoyed boating in our previous boat without thrusters and with only an electric windlass but we would much prefer to have both and to have both with very large operating margins. That’s why we prefer hydraulic operation. Dont you think the 56 is a good compromise in the trawler world ? If you had to change your boat would the 56 be on your list ? I do think the N56MS is a good compromise in the trawler world. The funny thing is we love sailboats. We went to the Extreme 40 race in Sydney, saw the start of a Sydney Hobart, went to the World Moth championships, watched the Americas Cup and would love to see one in person. We’re super interested in the technology behind racing and want to learn more about the tactics of sailboat racing. And yet, with all those sail related interests, we don’t have a strong desire to cruise a sailing yacht. I’ve seen sailboats we would love to cruise but they are highly automated wonders of technology and carbon fiber. Wonderful performing boats but amazingly expensive and service intensive. I can recall some nights in the South Pacific where a 100+ footer would shoot past us under sail at over 10 kts jumping between islands. There are some amazing performing sailboats out there but they are expensive and can be service intensive. Dirona is more of a work boat. It’s big, heavy, and strong. For us, it’s actually the not a bad set of compromises and the fuel it consumes isn’t a big problem for focus for us. We find the boat to be very good value overall. For us, it seems kind of amazing what we have seen and done all around would and we don’t feel like the fuel costs are material. The choice of a non-sailboat doesn’t seem to be a bad choice for our use cases. But we have both been on the N56MS (Nordsail One) and know it can do great things. 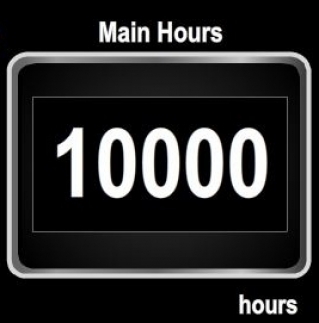 Congratulations on 10,000 hours! It will be really interesting to see what happens as you rack up thousands of hours more on the M/E in the future. It’s great to hear from you again Aaron. Yes, I’m 100% with you. It’ll be super interested in how the mechanical equipment does going forward. By the way, when do you graduate? Congratulations on your article always precise and complete and very interesting ! You burnt 270 000 liters which at today price in belgium 378 000€ ! Unbelievable ! When you bought your boat did you have a thought about the 56 motorsailor ? For: fuel maybe half, no wing engine… against : no flying bridge, height, …. what is your point of view ? Good trip ! It is a lot of fuel. The 56 motor sailor is a nice boat but, if we wanted to focus more on fuel, we could cut the consumption by a 1/2 by just slowing down a bit and we could cut consumption down to 1/3 by slowing down a lot. When we bought the N52, the standard engine was a 163HP Lugger. Adding another 100 HP doesn’t burn more fuel unless you use it but we do use it :-). There is something to be said for buying a smaller boat and, as a consequence of buying a bit less boat, being able to worry less about the expenses along the way. Hopefully you can get another 10,000 trouble free hours on it. I’ve read about some 6068 blocks going on 50,000 hours albeit in generator applications. I am finished with school in May and graduate in July. I’m looking forward to seeing where you end up deciding to work. You know the team at Nordhavn fairly well. I can introduce you to Metal Shark as well if helpful or you are interested. They do the New York City ferries, some big US Coast Guard and international contracts for small response boats, lots of law enforcement, tug boats, and more recently some big recreational cats. Ping me on email (jrh@mvdirona.com) if there is anything I can do to help.